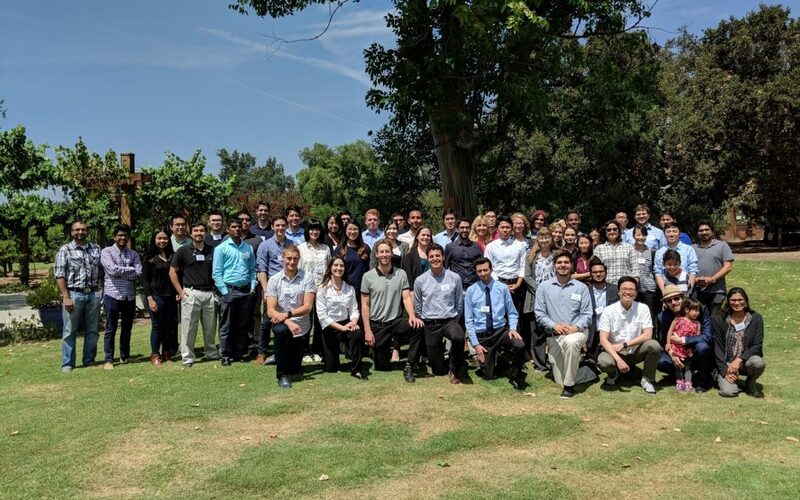 The 5th annual Southern California Micro and Nanofluidics Symposium was held on Friday, August 24th, 2018 at the Los Angeles County Arboretum. 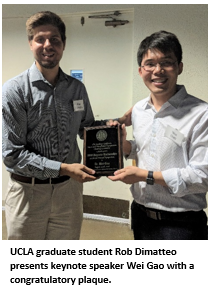 This year’s symposium, generously sponsored by Amgen and UCLA California NanoSystems Institute, brought together students and faculty from UC campuses to share research ideas and progress, seek opportunities for collaboration, and learn more about recent developments in the field of micro- and nano-fluidics. The symposium opened with a keynote address by Dr. Wei Gao from the California Institute of Technology, who detailed his work with bioelectronic devices for healthcare, as well as micro/nanomachines for drug delivery. 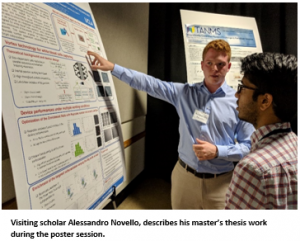 From there, the day included nine research talks from students and postdocs, a featured talk from Amgen’s Scientific Executive Director, Dr. Linda Narhi, and a poster presentation session. UCLA students made a great showing at the conference, with bioengineering graduate students, Joe de Rutte earning a 1st place speaking award for his talk, “Rapid production of highly tunable microgels for in situ assembly of microporous tissue scaffolds”, while bioengineering graduate student, Jaekyung Koh, and visiting scholar, Alessandro Novello also earned 1st and 3rd place poster awards for their respective work. The Southern California Micro and Nanofluidics Symposium was initiated in 2014 by Professors Dino Di Carlo and Sumita Pennathur in an effort to foster collaboration between local students. Since that time, the event has both grown and maintained free student registration due in large part to support from generous sponsors. The symposium is now completely student run, providing an excellent forum for local students to gain exposure to a wide breadth of research topics at all stages of their graduate careers, without the burden of expensive travel fees. “Building a network of young students who share their ideas and build collaborations can only accelerate progress in Micro and Nanofluidics,” says Professor Di Carlo. “We plan to expand this successful event to encompass a broader set of research groups in future years spanning the Southern California area”.